This World Environment Day, 5 Steps to Reduce Single Use Plastic – On Our Travels and In Everyday Life. The Ardennes is a region of which I only ever manage to catch a fleeting glimpse every now and again and every time I see it I wish I could see more. Having experienced this little problem in the 80s and again in the 90s I went back to Luxemburg for a wee winter visit about ten years ago – and, would you believe it, the same thing happened again. We spent more time in neighbouring Belgium and Germany than we did in Luxemburg and my time in the Ardennes was limited to a short trip I took to the northern town of Clervaux. Our group split up for the day and I travelled alone on the train from Luxemburg City. From Ettelbruck onwards there was a noticeable change in the landscape, going from the soft, rolling south of the country to the darker and more secretive north. Small rivers, edged by broken plates of very thick ice, washed up and left stranded like concrete slabs on waste ground, bounded and skittered through steep-sided valleys, the hills surrounding which were garbed in stubbly winter dress, trees bereft of growth and looking like a half-grown beard on the face of the land. Tucked away in these hidden valleys was the occasional house, puffs of smoke lingering in the damp air; or maybe there’d just be a lonely barn, while both road and rail were committed to a tortuous course, with cars and trains wandering like mice in a maze. The railway frequently resorted to tunnels to make any progress and in the cuttings that preceded them trickles of water had frozen overnight, or maybe over a period of days, with more water freezing over the top of it to form contorted lumps and bulges on towers of ice that appeared to lean on the sidewalls and were only ever glimpsed momentarily before the train plunged into darkness. The end of the tunnels always brought another scene. Here and there you might see a buzzard flapping about, or a cormorant on the move, but the herons never flinched as we passed and the mallards carried on bobbing on the eddies. These scenes came and went, alternating; in the tunnel and out again; light to dark; scenes strung together in no particular order but all joined by the common thread of the railway. Stations came and went, each with its own activity, where previously there had been none, until our arrival in Clervaux. I was the only one to get off the train and once it’d moved off I found myself, unsurprisingly, at the bottom of a steep-sided valley. The railway and the river took up all the room and the two or three buildings there had been pushed up against the sides, hiding in alcoves in the valley walls. There didn’t seem to be an awful lot there so I went into a shop to ask for directions. Although he didn’t speak any English the shopkeeper was able to make me understand the town was about a kilometre away and to get there I must follow a path over the intervening ridge. The path up the hill and through the trees was lovely and would be even more so in the spring. It gave glimpses downwards and led me to an abbey, which was closed for renovation, so I picked a path on the other side that led me down to the town. On the way I passed a church, which was beautiful to look at and even more so to hear. Its bells tolled sweetly the hour and these were not the stern-sounding bells we have here in the UK but sweet tinkling bells that played a happy tune. It sounded familiar and I felt I really ought to know it but I couldn’t place it. I suppose the most attractive sight in Clervaux is the whitewashed chateau. It’s accessed by an archway in the outer wall that leads through to an inner courtyard. There’s an American Sherman tank there, left where it was when it was hit while defending the castle during the Battle of the Bulge in December 1944. There’s a museum in the town that tells you much more than I could but it was closed – maybe winter’s not the best time to visit. By the end of the day I was back in London. Clervaux had been lovely but it was just a stolen moment in life; it gave me more questions than answers and made me feel, once again, that there’s so much more to see in this area of wonderfully quiet, peaceful, and timeless hills and valleys – perhaps I should go back? Have you tried Instagram? I love it. It’s where I post whatever photos I’m happy to share and I love its accessibility and reach. I can explore the world on Instagram. There are places in this world I’d love to visit but probably never will but I can see those places online and it’s all so easily done. It teaches me a lot; it informs me and sows the seeds of desire; it excites me, and it inspires me and most days I’ll dip my toe in the water there and see what I can find. But it has its limitations. A picture is worth a thousand words, or whatever it is they say, but tell me a scene that could accurately or fully be described in a thousand words. It can’t be done. We have five senses but a picture only works with one. When was the last time you smelled the rain in a flower meadow? Or in a pine forest? Have you noticed the different textures of the bark of different trees? Or the smoothness of certain rocks? Does a mountain stream taste as good as it looks? Is that blackberry as juicy as you imagine it to be? Have you ever heard a rabbit stamp its foot in warning? Or the wind swish through the feathers of a bird in flight? Best of all, I find, is that other sense you can sometimes feel hovering, almost unnoticed, at the very edge of perception. In my experience it’s only present when I spend a long time in one place and that place has to be one that’s ruled by the rhythms of the natural world. The best way to feel it is probably to spend the night on a beach; actually to settle down among the sand dunes, under an open sky; to fall asleep with the breeze caressing your face while the constant wash of the waves sets you adrift, and the last thing you see before your eyes finally close is a billion stars punching bright lights in the veil of night. You realise you can see infinity and wonder why you’ve never seen it before. You’ve seen the sky every day of your life and you wonder why you’ve never noticed it holds infinity in its depths. As your eyes close and you sink into nothingness you can almost feel your soul seeping into the earth and if you’re truly fortunate you can feel, wrapping itself around you like a toddler’s favourite blanket, a new sense; a sense that was there all along but had been drowned out in the clamour of life and its cares – the sense of eternity and its place within you. Because in that very moment you know, even more than you know your own name, that the earth is like this every night; that the tide always turns; that the stars eternally twinkle, and the sun always shines – and you’re a part of it. It’s been a bit windy here in the U.K. this week and I’ve always enjoyed a walk in the woods on a windy day. The trees come alive and there’s an air of vitality, a feeling of movement, and even hints of mischief that are sure to leave a smile on your face. But mine wasn’t the only face in the wood. 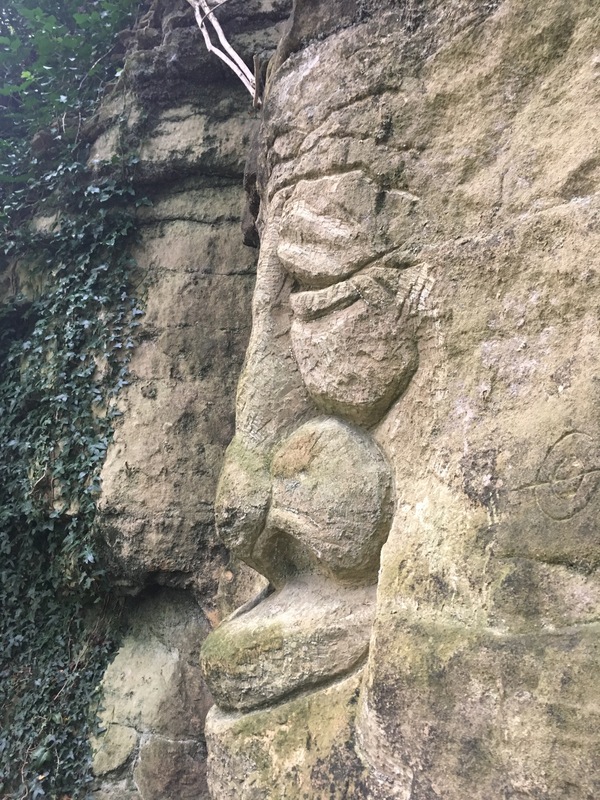 In this particular wood, between the villages of High Melton and Hickleton, the trees follow the line of a low crag of magnesian limestone. 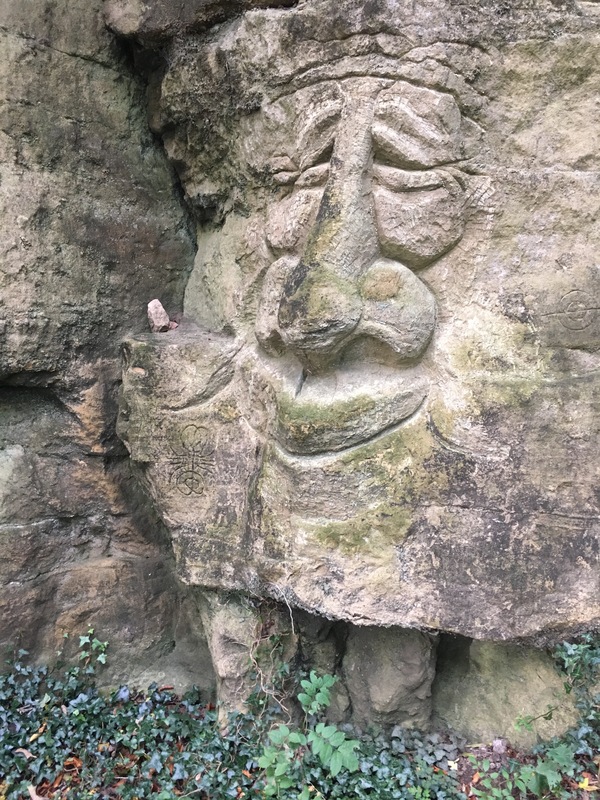 I’ve seen it before, many times, but I’ve never seen what I saw this week – a face carved in the stone. One of the best things about WordPress is just how easy it is to find and follow other blogs. 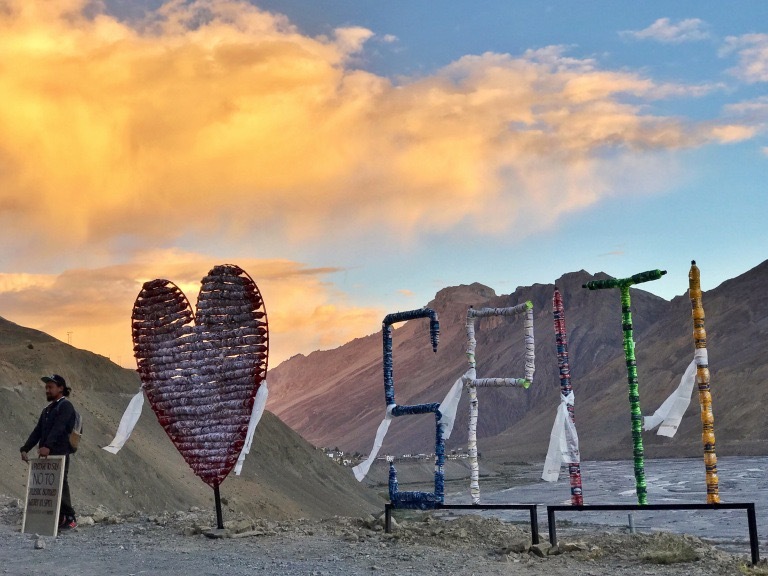 One of the bloggers I follow is Shivya Nath and I particularly enjoyed her recent post, I Love Spiti. Spiti is a beautiful valley in the Indian ﻿Himalaya that is slowly disappearing beneath a mountain of plastic waste. But what can you do? What can any of us do? And just what, exactly, did Shivya do?